If you pledged to develop healthy food habits as part of your New Year’s resolution, you’re not alone. You must have planned to snack on real fruits and veggies, stop binge eating or drowning in a pint of ice cream at the end of a rough day and drink lots and lots of water. How far along have you been successful? It’s already the fourth month of the year, and if your resolution is at the edge of falling short, you must be doing it wrong. Developing a healthy lifestyle is neither rocket science nor it is always about hitting the best gym in Jaipur (provided you are from the Pink City or anywhere else for that matter!). It’s just that the process takes time. Fortunately, you need not make huge changes to eat healthier and live better. The trick is to make small changes that will help you reach your goal faster. We bring you the best super simple food habits you should follow shared by industry’s top fitness experts. All fruits and vegetables are composed of different minerals, vitamins, phytochemicals, and antioxidants which is why bear different colors. Therefore, the more colors you add to your plate, the more variations (nutrition-wise) you will get. While green leafy vegetables are rich sources of proteins, iron, calcium, and fiber, fruits add to your potassium, vitamin C, and folate intake. Plus, variation keeps your menu interesting so that you do not get bored. Crash diet is a hurried solution opted to take care of temporary needs. (Trust us on this!) It has never helped anybody. Crash dieting will be still unhealthy even if you are on a full-fledged juice diet all day long. Rather eat all your meals, especially your breakfast. Most studies reveal that people who eat a substantial portion in the morning lose more weight than those having lighter breakfast. Try muesli with fruit and yogurt or eggs on whole grain bread. 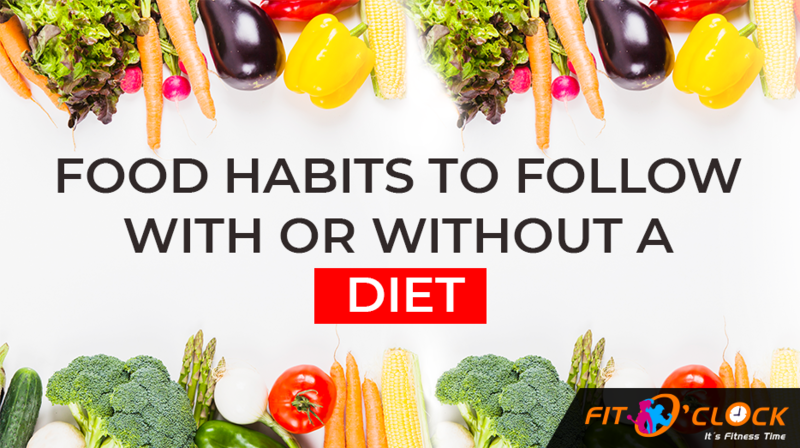 Once you start eating right and on time, your health will get back on track. You probably must be aware of the fact that whole grains are rich in far more nutrients and dietary fibers compared to their ‘refined’ white counterparts. Plus whole grains have lower GI (glycaemic index) which keep you feeling full and maintain your energy levels for long. When it comes to taste, whole grains offer better taste, flavor, texture and are nuttier on the inside. While we are on this, also try switching to brown rice instead of white and wholegrain pasta at the same time. There is a famous saying that goes, ‘the more you’ll do to your food, the less it’ll do for you.’ Almost all fitness experts swear on this mantra. Try grilling or barbecuing all your meat, fish and vegetables. Use very little olive oil or cooking oil to fry your veggies. Opt for herbs, spices and ground pepper and very little salt. Consider lemon juice to salad dressing. It’s tastier too. Have homemade sauce instead of bottled versions. Even if you feed on real veggies and fruits all the time, it won’t make any difference if you do not have your portions in the quantity you are supposed to. While in restaurants never order anything that has been supersized for lesser price. Choose appetizers instead of starters or split your dish with a friend. While at home, use a smaller plate for your major meals. Half your dinner plate must be filled with vegetables or salad. Serve on individual plates to avoid second helpings and never eat from the packet itself. Serve a smaller portion into a separate bowl instead. As mentioned earlier, refined grains serve no good to your health. They are low in dietary fiber and are even stripped of many nutrients. Such food includes white bread, regular pasta, white flour and most snack food. Also, do not get sabotaged by sweeteners. Limit your food with added sugar (soda, desserts, energy drinks and candies lead the chart). These are empty calories, and all they do is contribute to weight gain. Also, they can trigger triglyceride levels which may increase your risk of heart disease. Red meat and processed meat are high in saturated fats and negatively boost bad cholesterol. Therefore, switch to saturated fats found in nuts, fish and vegetable oils. Also, go for lean meats and skinless poultry. Avoid packaged baked goods (cookies, cakes, pies, donuts, muffins, croissants, bread, and biscuits). They are rich in trans-fat. This includes crusts and frosting too. Also steer clear from canned biscuits, cinnamon rolls, and frozen pizza crusts. Most commercial cake and muffin mixes also contain high quantity of trans-fat. Read labels carefully before buying your products. Water detoxifies the body giving you a healthy glowing skin. Your body should receive its essential dose of minerals through water every day. But there is a catch. You should be aware when to drink and when to avoid it. Try to avoid drinking altogether during meals as it slows down the digestion process. Have water half an hour before or after having your meal instead. Things can get even better if you get yourself an aluminum bottle, keep it at arm’s length and sip it all day. Most health authorities recommend drinking half a gallon water every day. Chewing well is an obvious necessity as it makes your food digest faster. Therefore, it is always advisable by our elders to never eat food in a hurry because we tend to skip the chewing part. Chewing thoroughly helps you absorb more nutrients from food, keep your weight in balance, makes way for easier digestion and fewer digestive issues like gas and bloating. Also, you burn additional calories while moving those jaws. Consume alcohol in moderation. It should be just a drink a day for women, two for men and even lesser for older people. 12 ounces of beer qualify as one drink. Similarly, 5 ounces of wine and 1½ ounces of 80-proof spirits and so on. NOTE: Also, it goes without saying that higher intakes can lead to various health problems (which also includes the risk of certain cancers). Expecting mothers should avoid alcohol altogether. Achieving a healthy food habit is all about maintaining a nutritious diet and of course, being physically active. It is always a plus to hit the gym for quick workout sessions. If you are from Jaipur and are looking for the best gym and fitness center in Jaipur, try Fit O’ Clock. It has been offering gym-goers the most convenient, affordable, and friendly trainers to help them get in shape in no time. coverage! Keep up the awesome works guys I’ve you guys to blogroll. I think the admin of this site is genuinely working hard for his web site, as here every information is quality based stuff. hsve a good read. I appreciate you forr sharing! article tto him. Fairly certain he will have a good read. Below you will come across the link to some web sites that we believe you’ll want to visit. Appreciation to my father who informed me regarding this weblog, this web site is truly awesome. post. Thank you one million and please carry on the gratifying work.